I should have never said I was going to post menus every Monday. I have been living my last 2 years with no deadlines whatsoever and suddenly adding one task, regardless of its simplicity, throws me into a frenzy. Not really, but I felt like there was something hanging over my head for the last couple of weeks. So I’m officially saying I may not post a menu every week, but I will give you two weeks worth today. Monday: Pizza This one was a little different. I double this recipe and usually make 4 pizzas. This time, I did double it, but used whole wheat flour instead of bread flour and it didn’t turn out well at all. The dough didn’t rise and it was really dense. Of course we still ate it, but it wasn’t very good. Tuesday: We had a dinner playdate at a friend’s house and I brought dessert. I made the Magic Cookie Bars without nuts because we have a friend with a severe peanut allergy and because walnuts are gross. 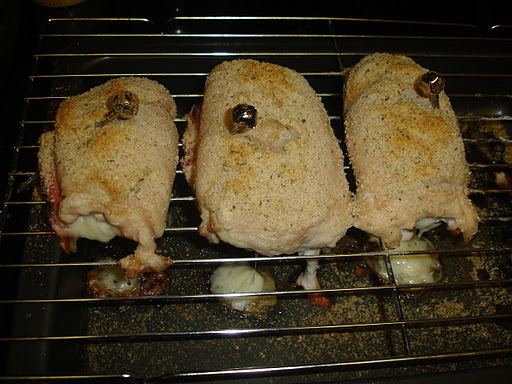 Wednesday: Chicken Cordon Bleu This turned out way better than I thought it would. I even took a picture! We never have toothpicks so I had to use Christmas drink skewers. They have bells on the end. Thursday: Tacos – nothing fancy at all. Store bought shells, turkey with the regular taco seasoning and all the regular taco toppings. Friday: Cream of Potato Soup This was good, but really rich. I used the cream base recipe in the link and then cut up 4 baked potatoes and a bunch of scallions to add to it. One thing I changed was using 1/2 skim milk and 1/2 half and half. I didn’t think the skim milk would thicken the way I wanted it to, but the half and half was almost too rich. I think 2% milk would be perfect. We had cheese and bacon for toppings. Saturday: We didn’t really eat dinner. We were watching our beloved Hawkeyes at a local Iowa bar and ate bar food late in the afternoon so it kind of stuck in our guts for the rest of the day. Sunday: In-N-Out It was Kamryn’s birthday so she got to pick the food for the whole day. No complaints from this corner! Monday: Meatloaf I made this in the crockpot. I actually used beef instead of turkey this time and bought a seasoning packet. I usually just make up my own, but I wanted to try it. Those seasoning packets are really salty. Anyway, I mixed it all together, threw it in the crockpot for 5 hours on low and it turned out pretty well – just a bit too salty so I probably won’t use it again. Tuesday: Big Salad This is exactly what it sounds like. If you are still unclear what this is, there is a whole Seinfeld episode about it. It’s not a regular salad, it’s a big salad. Wednesday: Beef and Veggie Stirfry This is one of our go-to meals when we don’t know what to make. It’s cut up beef and frozen vegetables in a stirfry sauce with rice. Thursday: Marinated Grilled Tuna with mango salsa I don’t really follow the recipe too closely – more just the idea. I used yellow fin tuna instead of mahi mahi, but I did follow the marinade recipe. I passed on the coconut rice since we had stirfry the day before and the mango salsa I just threw together on my own. I cut up cilantro, mango, tomato, red onion and squeezed some lime juice in it. Friday: Jersey Mikes It was supposed to be the baked potato bar, but it was kind of hot that day so it didn’t sound real appetizing and since I didn’t have a back up, we got subs. Saturday: Braised Ribs with White Beans and Fresh Herbs This is one of my all time favorite recipes. It is pretty involved, but it is well worth it. I have made it with fresh herbs and with dried and I think I prefer the dried herbs. I also like to double the beans. It’s really filling and pretty cheap to make. Sunday: Pizza Same recipe as above, but I’m back to using bread flour. I know this is probably not the norm, but my kids eat all of the stuff I make. Fish is a tough one, but tuna really does taste a lot like chicken. Kamryn is a much better eater than Rory, but he surprises me every once and awhile and likes something that I don’t think he will. However, that being said, I refuse to make a separate meal for the kids. They aren’t required to clear their plates, but they have to at least try what I make. And I usually have at least one side dish that I know they like. Afterall, I remember my mom making liver when we were kids and we either ate it, or didn’t eat. She wasn’t making an extra pot of mac and cheese for me and my brother. I’m not chastising anyone for making your kids extra meals, I’m just lazy. This entry was posted in food by Amy. Bookmark the permalink.